Rambutan is a fruit that is small in size and red in color. The skin has spiky hair on it. The flesh of this fruit is juicy and sweet, and is slightly acidic in nature. The seed of this fruit is brown colored and the oil extracted from these seeds is used in various industries. Yellow colored rambutan is also available. The fruit as well as the leaves, rind and bark of rambutan have lots of health benefits. Water is present in high amounts in rambutan, which helps in keeping your skin soft and supple. It also acts against the free radicals in the body, thus protecting your body from oxidative damages. Rambutan is also rich in antioxidants, which protects the body from cancer and other major diseases. Rambutan helps in making your hair healthy and strong. A paste made out of rambutan leaves is excellent for your hair and keeps it well nourished. To make a paste of rambutan leaves, take some of its leaves and mash the leaves till you get a smooth paste. Add some water to this paste and take out its extract. Apply this on your scalp and the hair, leave for about 20 minutes and then wash off with water. Using this regularly will keep your hair healthy. The antiseptic properties of rambutan help your body to fight against various germ that cause infections in the body. Rambutan is a rich source of Vitamin C. This helps the body to absorb iron, copper and other minerals more effectively. It also reverses the actions of the free radicals and protects the body from various ailments and premature ageing. Rambutan is rich in carbohydrates and proteins, which helps in preventing bloating and to increase energy. The high content of water present in rambutan aids in giving you back the energy you have lost. It is also an excellent fruit for quenching your thirst. Rambutan is a rich source of Gallic acid, which plays the role of a free radical scavenger and protects the body from the harmful actions of the free radicals. This way it keeps the body healthy and young. It is particularly effective in fighting against various types of cancers. Copper is found in sufficient quantities in rambutan, which helps in the production of red blood cells as well as white blood cells. The presence of manganese in this fruit helps in the production and activation of enzymes. Those who are on weight control diet benefit a lot by consuming rambutan. This is because this fruit is rich in fiber ad low in calories. So it keeps your stomach full for a longer time and prevents you from overeating. This way it helps you in losing weight effectively. 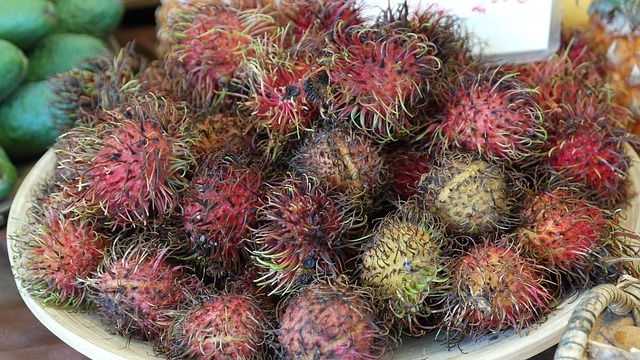 In addition to its nutritional values, rambutan also has therapeutic properties. If you consume this fruits regularly, you can get rid of intestinal parasites and also get relief from various symptoms of diarrhea and fever. Phosphorous present in rambutan is important for the development as well as the repair and maintenance of tissues in the body. This also helps in proper removal of waste from the kidney. Calcium is also found in good quantities in rambutan, which along with phosphorous helps in making the bones and the teeth strong. Deficiency of iron causes anemia, which results in dizziness and fatigue. Consuming rambutan regularly ensures that you get sufficient amount of iron. This increases the availability of oxygen in the body and prevents dizziness and faique. In Indonesia and Malaysia rambutan is used in the form of medicine to heal various ailments. This has been used from ancient times to treat hypertension, diabetes and a number of other ailments. Some of the common illnesses like thrush, headache and diarrhea can be treated with rambutan. If you are suffering from headache, you can put the leaves on your temples and you will get relief soon. To treat thrush, make a decoction with the bark of rambutan and apply on the tongue. To lower the body temperature due to fever, make a decoction with the root of this plant and have it. Rambutan is a good substitute for lyches. You can add this fruits to various fruit salads you prepare. It is also possible to make jams and jellies with this fruit. When you have yogurt, cocktails, deserts, chutney, soups, smoothies, salsa etc, you can add rambutan with them. Mash a few leaves of rambutan by adding a little water and then filter it to get the extract. Apply this on your damp scalp daily and this will give you a healthy hair. This helps in making your hair roots strong and enhances the growth of hair. Eat the seeds of rambutan raw or mash them and apply it on your skin. This will provide you a clear skin that is healthy and soft. Take the skin of rambutan and boil this skin in water for a few minutes. Let it cool, and then drink this liquid every day. Have it at least twice daily. Take five seeds of rambutan and roast thee seeds. Mash these seeds well till you get a fine powder. Put this powder in a glass of water and drink it daily. You can also have it twice daily and this will help in controlling the level of blood sugar in the body. Dry the leaves of rambutan and boil 15 gm of the dried leaves in three glasses of water. Let it cool and then strain it. Consume this mixture three times daily to get relief from fever. Can the rambutan grow well in west Africa specifically Ghana? If possible, how do I get some of the seeds to plant. 2. Can it treat baldness or bald hair?